I have been reading on my Google+ groups and talking to a lot of cyclist in my cycle club who have a fear or reluctance to ride after the sun goes down. I am posting this on all of my cycle groups so that you all can get a good opinion on riding at night. All summer I ride most of my morning commute in darkness. When daylight savings time ends I will start to ride most of my evening commute in darkness all winter. Riding in darkness has it’s advantages and disadvantages. I will discuss some of the best ways to optimize riding in the dark based on my experience. Just this year alone as of this writing I have cycled 6,883 miles. Of that mileage I have bike commuted 4,768 miles. I estimate that almost half of the bike commuter miles was in darkness. I have ridden my bike in the dark in California, Oregon, Texas and now Georgia. Each time I have stopped riding for a year or two and I start up again I have to relearn a few things on my bike. For this discussion I had to relearn how to ride in darkness I have been putting off writing about this for some time, but today is the day to write it. When I started bike commuting last year here in Georgia back in September 2012 I was mostly riding a short 8-12 mile commute in the city. I was using my Niterider Headtrip. I got the Headtrip way back last century when I was living in Oregon. I used it with my lead acid based Cateye frame mounted two light system. Since I was riding on lighted streets the Headtrip worked out fine. When I am wearing my head mounted light I will to position the beam so that it is aimed about 30 to 50 feet in front of me with my head in my normal riding position. 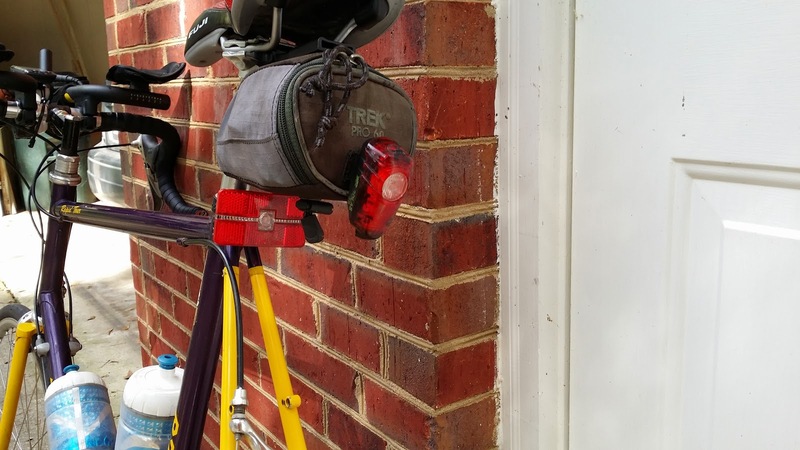 Most cyclist think that helmet mounted lights are only for mountain bike use, but I like to bike commute on the road with one for several reasons. When I am riding at night I want drivers to see me before they turn left into my path or pull out from a driveway or side street in front of me. I like to have my helmet beam mounted so that when I look at a car the beam will hit the driver right in the face. There is no mistake that they see my beam so they know where I am. My Niterider Solas and a generic flasher on my rear tool bag. So this brings the discussion to an interesting point, how many lights do you use when riding at night? Well for me at a minimum I ride on the road with one frame mounted light as I ride mostly down country roads on my commute. On the country roads I have the same problem with cross traffic as in a busy city, but for different reasons. Instead of cars pulling into my path I have a fear of deer and wild hogs getting in my path. When I am riding at night and I hear any sounds in the brush at the side of the road I yell out “wooop, wooop” so that the deer or what ever is there will know I am riding by. This generally lets the deer judge my speed and they will run along the side of the road with me until they see that they can out run me and cross in front of my bike without causing me to hit them. 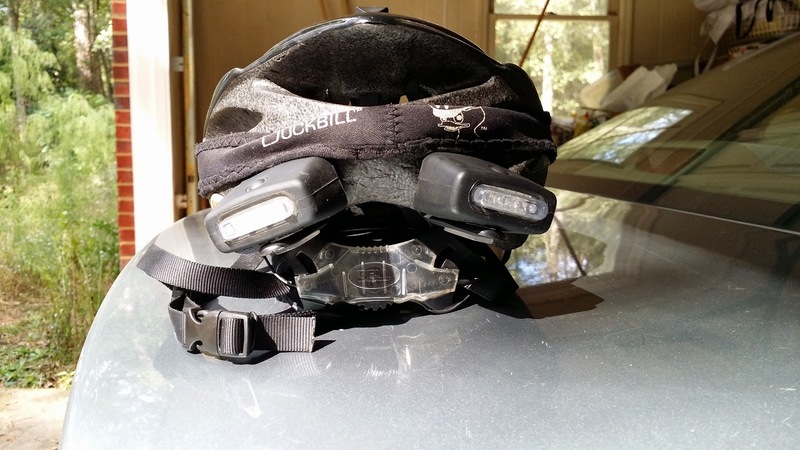 This week I am going to put my light back on my helmet because having two lights looking forward is the safest way to ride at night on the road or on the trail. Two lights make the shadows disappear in areas close around your bike in the dark. When I am riding having a bike light on my frame lights the path where my bike is pointed. Having a light on my helmet lights the path where I am looking. I will always look in the direction I am turning before I turn my bike. In the dark I need every split second of advantage to make decisions that I would normally take for granted in full daylight. I also have two red flashers on the rear of my bike and I have two flashers on the rear of my helmet. I ride in rain and fog so I always want to make sure motorist can see me. If I get hit by a motorist it will be from a motorist who is drunk, sleepy or just wants to take me out. I will not be hit by a motorist because they were alert and did not see me. I always turn on my rear flashers when I am riding into the sun or riding where there are a lot of shady trees on the road. I try to remember how it is when I am driving and imagine what the road is like for me as a motorists. Anytime I am on a road and I am riding into the sun motorist will have a hard time seeing me so I turn on my rear flashers. Now that I have covered my thoughts on gear I want to share some experiences with riding in darkness. When I started bike commuting I got bored really fast on the short 12 mile one way commute in through the lighted part of town. When I lived in Portland I had about 4 or 5 ways to get to downtown from my home in Washington County. I started out in Portland riding on lighted streets and soon found myself riding on Skyline drive in pitch blackness hoping not to hit a 1,200 pound elk when I was going 46 MPH down the hills. Just like in Portland in the 1990’s I had to overcome my fear of cycling alone in darkness here in Albany. Although it is really flat here and I do not reach speeds over 20 MPH on my bike commute I still have to watch out for deer, wild hogs, rabid foxes and dogs on my bike. After the first two trips down Eight Mile Road where it is totally dark last winter I was forever confident on riding in darkness in SW Georgia. To be clear my adrenalin is always going full speed when I hear somthing rustling in the bushes or grass on the side of the road and I can not see what it is, but I keep riding anyway because I love riding my bike at night. One of the main advantages that I have found by riding in darkness is that I am more aware of where motorist are when I am cycling. For a long time I always cycled with a rear view mirror on my glasses I have been riding without one for almost a year. At night you can see headlights coming towards you and you can see them coming up from the rear without looking. Most motorist drive on country roads with their lights on, but I know that I have occasionally seen a motorist driving with their head lights off so I am aware of these crazy folks are out there and they may be drunk. Another advantage to riding in darkness is that it is cooler than riding in full sunlight especially during summer days. As a bike commuter if I do not ride my bike to work and then to home I do not have enough time to get in my cycling fix. 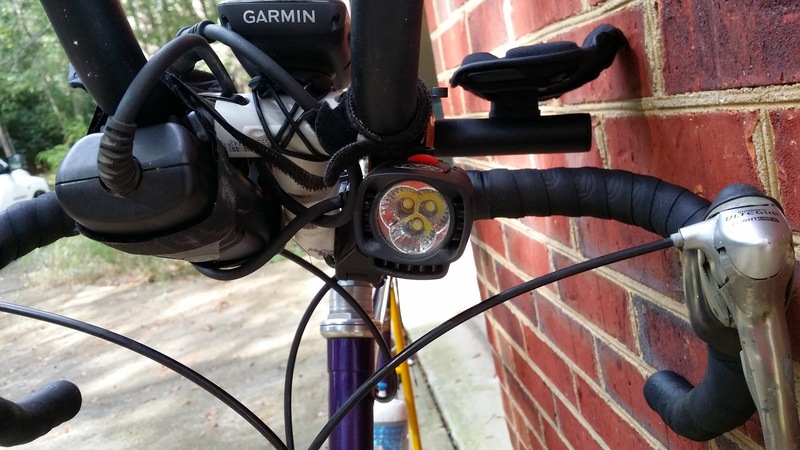 By having lights on my bike I extend the time during my waking hours that I can enjoy cycling. Do not let the fear of cycling in darkness steal the valuable time when you are awake to ride your bike. Ride in darkness when all of the motorist are asleep.